How much do voters care about Hillary’s and Trump’s health? Just How Much Do Voters Actually Care About a Candidate’s Health? New York City Mayor Bill de Blasio speaks with Hillary Clinton during a memorial service at the 9/11 memorial on Sunday in New York. But just how concerned are voters about the candidates’ health? Are they concerned enough to actually change their minds about who they’re voting for this November? We’ll have to wait a few more days before the pollsters can begin to answer that specific question—and even then, it will be difficult to tell whether Americans are responding to Clinton’s health scare or how the Clinton campaign handled it, or other unrelated factors. But past surveys suggest that voters really do see a candidate’s health as a pretty big deal. 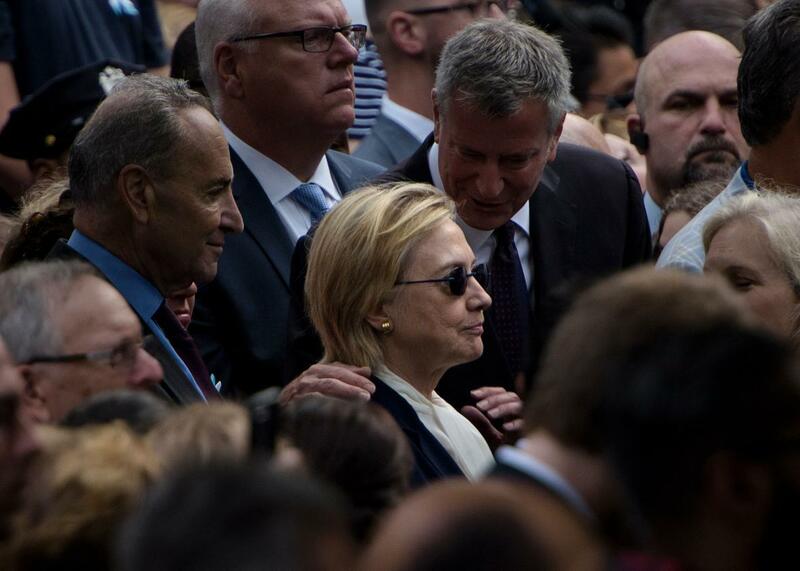 A recent Rasmussen poll conducted last week before Clinton’s early exit from the 9/11 memorial service, for example, found that 86 percent of likely voters said that a candidate’s health was important to their vote, compared with only 12 percent who said that it was not. Those figures were generally consistent across party lines, too: 89 percent of self-identified Republicans, 85 percent of Democrats, and 85 percent of independents described a candidate’s health as important. Pollsters who have asked a similar question in recent elections found similar results. Of note, however, was that a clear partisan divide emerged when Rasmussen asked respondents specifically about the then-pre-pneumonia speculation about Clinton’s health: 73 percent of Republicans said such concerns were legitimate compared with only 17 percent of Democrats who said the same. (Roughly half of independents agreed.) You’d expect those Dem numbers to climb after several news cycles dominated by the viral video of Clinton’s near-collapse in Manhattan, but it would be a shock if the partisan divide disappeared. A sizable swath of voters, after all, say their chief motivation for voting for Clinton is to prevent Trump from becoming president. Given that, it’s difficult to see how questions about Hillary’s health would make them rethink their opposition to Trump’s very being. Consider the conversation about John McCain’s age eight years ago. McCain was 72 on Election Day in 2008, only a few years older than Trump and Clinton will be this November. In many ways, the discussion about McCain’s age was a proxy for his general health, particularly given the time he spent—and the injuries he suffered—as a prisoner of war in Vietnam. In a Pew Research Center survey conducted in the summer of 2008, roughly 1 in 5 voters said that McCain was “too old” to be president. Tellingly, though, self-identified Democratic voters were far more likely than their Republican counterparts to believe that to be the case: 34 percent to 7 percent. Those numbers are even more illustrative if you compare them with the results Pew got when they asked the same question four months earlier, back before McCain had emerged as his party’s nominee. Between February and June, the percentage of Democrats who said McCain was too old inched up one point, from 33 percent to 34. The percentage of Republicans who said the same thing, meanwhile, was cut in half, from 14 percent then to 7. Democrats just aren’t going to bail on their candidate over this. Read more of Slate’s campaign coverage.